Instrotech’s Model 9004 is fully programmable with SmartView software. ONE of the smallest load cell transmitters available on the market today, Instrotech 's new rail mount Model 9004 measures a neat 92 x 92 x 26mm wide. 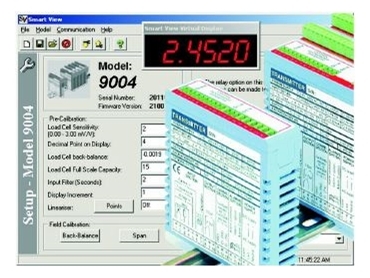 These isolated units are fully programmable, with set-up being made via a computer using the free Windows-based SmartView software. Pre-calibration ranges can be allocated to zero and full-scale values, which may then be adjusted to allow for deadweight offset and deadweight span calibration. A 16-point software lineariser is also provided for adjusting non-linear systems. The 95-265V ac/dc switch mode power supply can power up to six load cells. Full 6-wire configurations are provided for with standard 10V excitation, sense feedback to compensate for cable loss, and mV input. Excitation is also user selectable to 5V or 3.3V for applications with intrinsically safe barriers. Outputs are isolated 0-10V or 4-20mA, user selectable. The stable bridge excitation voltage is also selectable for normal or intrinsically safe applications. Load cell sensitivities are programmable from 0.00 to 3.00mV/V. RS232 serial interface is standard for connection to computers for SCADA applications, using the Digibus protocol. RS485 is available as an option, and allows for linking up to 99 transmitters on each bus. Other options are one or two solid-state relays with programmable setpoints, hysteresis and time delay. The precision instrumentation op-amp front-end circuit ensures high accuracy and stability, and a digital filter feature allows for a stable output in noisy systems. Tested and complying with the required C-Tick and CE EMC and EMI regulations, a 3-year guarantee is standard on all Instrotech instruments.